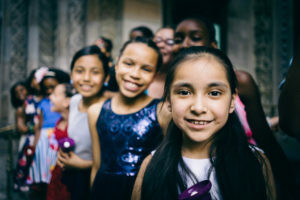 Education Through Music (ETM) partners with inner-city schools to provide music as a core subject for all children, and utilizes music education as a catalyst to improve academic achievement, motivation for school and self-confidence. We currently serve nearly 30,000 students in 57 inner-city schools. We believe that every child deserves access to high-quality music education, taught by qualified and well-trained music teachers. Music should support learning in other key areas, including math, science and language arts. Engaged parents and school communities are key to the success of students. Many schools, especially those in low-income communities, do not have the resources to provide students with a comprehensive music program. We are dedicated to ensuring that all children, despite economic or social status, get the education they deserve.